Paul Kearney might just be one of the undiscovered, rather than hidden, gems of fantasy fiction. His début “The Way to Babylon” (1992), two subsequent stand alone novels and a more traditional epic fantasy series “Monarchies of God” counting five books, all failed to bring a financial breakthrough even though these books were often praised by critics at least as competent efforts if not beyond that. His latest started (but never finished) trilogy “The Sea Beggars” – the first book of which I am about to review, was sadly dropped by Bantam, Kearney’s publisher at the time, just after the second book. The official explanation was not surprisingly of a financial nature. Hopefully his streak of bad luck will have ended this year with a new upcoming title “The Ten Thousand” (September 2008) backed by a new publisher - Solaris, which also plans to reissue the five Monarchies of God books as an omnibus duo. Intrigued by Adam’s (The Wertzone) perseverant endorsement of Kearny as a severely underrated author, as well as by the blurb on the cover of “The Mark of Ran”, written by Steven Erikson, proclaiming Kearney as one of the best fantasy authors out there, I’ve decided to read the damned thing myself. And guess what, despite the fact that the book has its flaws, I was still pleasantly surprised and have to agree about the underrated part at least. The World is slowly dying, forsaken by its Creator. Mankind schemes and plots and makes war across the world, forgetting that they are not its sole inheritors. Another race once dwelled here… We witness the story of Rol Corthisan, an orphan and a farm-boy, whose undisclosed heritage makes him unaware of his hidden potentials – now where have we heard that before? After his safe haven is destroyed he has to seek his only chance at help and knowledge. Afraid and alone he sails through a storm to a neighboring island state, where the mysterious figure of Michal Psellos takes him in. While under his patronage, Rol learns many skills (most of them are about being deadly) as well as finds himself in love with Rowen, his beautiful tutor and the only person besides Rol, who shares his ambiguous status in Michal’s household and is unfamiliar with her parentage. Without giving out too much let me conclude this brief synopsis by revealing that everything is not what it seems to be in the tower of Michal Psellos and after things get complicated and then resolved after a fashion, Rol sets out onto the sea, where a new life awaits him, a life full of danger and opportunities…but even as he tries to run from his personal past, a different kind of past rushes headlong into his direction instead. 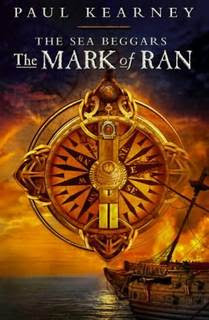 “The Mark of Ran” reads like a simple and straight-forward story, which it is after a fashion, but Kearney also manages to transcend such trite generalization with his competent writing skills, fluid narrative, killer pacing, detailed world building (the annexed map and the mythos are intriguing at the least), carefully deployed mystery element of the general plot and the likeability of the characters, as well as plausibility of their actions. I’m not sure why, maybe the cover blurb is to fault for the comparison, but Kearney’s prose seems in a way akin to that of Erikson – the flow of narrative for example. If I tried hard enough I might also find some similarities between Rol and Crokus (a character in Erikson’s “Malazan Book of The Fallen” series). Where the story starts to drop in intensity is well into the second half of the novel, which follows Rol as he traverses the seas as a sailor/officer. The seafaring part cannot possibly match up to the earlier chapters. Rol’s growth as a character seems to stall significantly in exchange for (in my opinion) filler action scenes and seemingly random courses in seamanship. The terminology itself didn’t bother me that much, but if you are not interested in principles of sailing and (old) sea vessels this sections of the book might bore you some. Otherwise, I have to congratulate Kearney for not being afraid to kill people in his book, although the main cast seems a bit untouchable at moments. The body count is quite high in the end. One other thing I liked is how Kearney handles the love story - well not the love part of the story per se, it is only that he treads around this theme really elegantly, showing us love's bitter-sweet side without overdoing it. With barely under 400 pages this novel rarely falters. “The Mark of Ran” is a well executed epic fantasy, which doesn't deserve to be buried under a heap of unremarkable fiction littering the market. (I will save the peculiar story of how I got this book for later.) All in all, this novel is more than a decent read and although a bit short of brilliant, it still made me eager to read its sequel - "The Forsaken Earth".